In today’s challenge I look at two emotions: fear and disappointment. 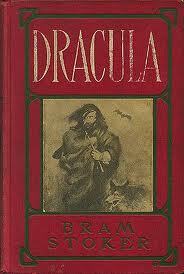 The stand-out contender for an emotionally draining book is, for me, beyond doubt Dracula by Bram Stoker. I read this when I was a teenager, and it is still the scariest novel I’ve ever read. So terrifying did I find it that I could only read a few pages at a time. Then I had to put the book somewhere I couldn’t see it (not in my bedroom!) and leave it for a few days while I recovered from the frights. As I progressed I got so that I could read a whole chapter at a time, but I still took weeks to finish it. This experience has become my standard of scariness, and all other horror books have fallen far short of it, producing more disappointment than fear. In fact the overwhelming emotion of disappointment has caused me to set several aside – permanently rather than for a few days. I have never re-read Dracula. If I did would it too produce disappointment? Maybe one day I’ll find out. Cover art from Page Pulp, which has an article on the Many Covers of Dracula.